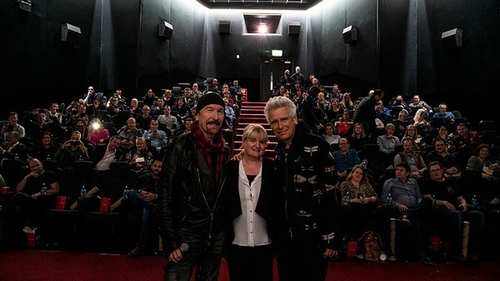 U2 stars Adam Clayton and The Edge were surprise guests at a special screening of the movie Rattle and Hum at the Savoy Cinema in Dublin last night. On the eve of the thirtieth anniversary of the world premiere of the Phil Joanou film, 100 U2.com subscribers were invited to The Savoy where the film was first shown on its release in 1988. "It was a musical journey," recalled Adam on U2.com, referencing one of the most memorable lines in the film, while The Edge recalled the challenge of making a film . . . when they weren't really sure what it was about and that never had a script. The two band members also introduced Sandra O'Donoghue, an usherette at The Savoy on the evening of the 1988 premiere, and now the venue's General Manager.